Mix the lemon zest with the sugar. Cover the base of a baking tray with most of the lemon sugar. Lay the strawberries on top and sprinkle over the remaining lemon sugar. Pour in the verjuice and cover the tray with foil. Cook for 10–15 minutes until the strawberries are just tender. Purée 350 g of the strawberries for the mousse and set aside in a saucepan. Cut the rest in half and set aside in their liquid. To make the mousse, place the 175 g of sugar and 2½ tablespoons of water in a saucepan and begin to heat to 121°C. Just before the syrup reaches the required temperature, start to whisk the egg whites and the extra 10g of sugar in a mixer until frothy. Once the syrup reaches 121°C, slowly pour it into the egg whites, whisking on high speed. Whisk for 10 minutes until the mixture has cooled. Soak the gelatine leaves in cold water for 5 minutes. Warm the reserved strawberry purée over low heat, then squeeze the excess water out of the gelatine leaves and stir them into the hot purée until dissolved. Transfer to a large bowl and leave to cool slightly. Whisk the cream to soft peaks. Fold the egg white mixture into the purée, then carefully fold through the cream. Refrigerate for 2–3 hours (but preferably overnight) until the mousse has set. 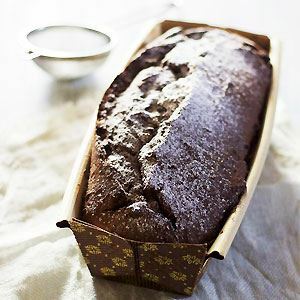 Bake one tray at a time for about 7–8 minutes until golden brown, then take out and roll lengthways over a cannoli mould or clean broom handle to form cannoli. Remove from the mould and leave to cool. You need to work quickly, otherwise the cannoli will set hard while still flat. Store in an airtight container. To make the yoghurt ice-cream, whisk the sugar into the cream. Place in a pan over medium heat and heat until the sugar has dissolved, about 2 minutes. Leave to cool. Place the cream mixture in a food processor with the lemon juice, zest and yoghurt and blend together. Churn in an ice-cream machine, according to the manufacturer’s instructions. Assemble just before serving, otherwise the cannoli will go soggy. 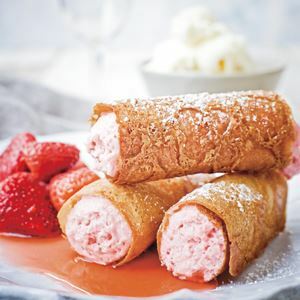 For each serving, ?ll two or three cannoli shells with strawberry mousse and place on a plate with some strawberry halves and syrup. Dust with icing sugar and serve with the yoghurt ice-cream alongside. 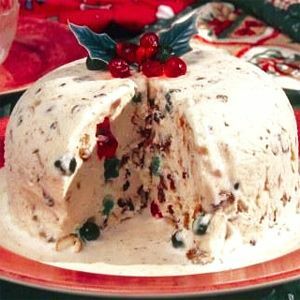 Ideal for Christmas lunch or those very special occasions.